White Sauce Recipe For The Gluten Free Diet. This white sauce recipe is really not complicated at all. It is simply a matter of combining a fat and a flour and bringing it to a bubble over low-medium heat. Stirring constantly is important to prevent lumps and scorching. Once the mixture comes to a bubble, you can add the liquid gradually, in small amounts. Some people use a whisk. I use a wooden cooking spoon. Keep stirring until the liquid is incorporated and the mixture is smooth. Then add more liquid, until it is all incorporated. Cook over medium heat until it just reaches the boiling point, then turn down heat and cook for 3 minutes more. That's all there is to a white sauce recipe! Melt butter over low heat, allow to cool slightly, and then incorporate the gluten free flour. When smooth, turn up heat and keep stirring until mixture bubbles. Gradually add milk, stirring constantly to avoid lumps. When all the milk is incorporated, bring to a boil and then reduce heat. Cook for 3 minutes more. Add seasonings after removing from heat, and blend into sauce. I like my sauces a little thicker than this, so I would personally use 1 1/2 Tablespoons flour to 1 Tablespoon of butter. You can substitute canola or corn oil for the butter or margarine if you wish. If you use a milk substitute, it may be necessary to add extra fat to make it creamier. If it is very thin compared to milk, you might need to add powdered milk substitute. There are powdered soy milks available. I use Vance's Dari-Free, which is made from potato. I like to use the sweet rice flour, which has a better texture than regular rice flour and is not as gritty. Note: I do use potato flour for a white sauce or roux if the recipe uses potatoes. Otherwise the flavor is too strong. You must be very careful with potato flour. It will very suddenly begin to color, and if you don't immediately remove it from the heat, it will scorch. It is quick though. If you find it easier, you can also heat the milk, and after the blended flour and butter cools a bit, add it to the milk. You need to stir the milk constantly while adding to prevent lumps. Bring mixture to boiling point and cook 3 minutes or until thick. Cook as directed under thin white sauce. To make a larger amount, double or triple the recipe. To make a gravy, you would substitute the pan drippings for the butter or oil. Allow the fat to cool before adding the flour or it will lump. 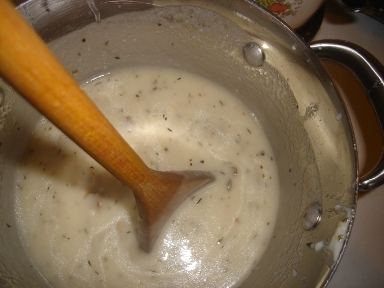 For cream of mushroom soup, use fresh mushrooms sliced 1/8 inch thick or so, about 1/2 cup. Or use a 4 oz can, drained. Saute mushrooms until tender and lightly browned. Add to sauce after combining milk and flour/fat mixture. Allow to cook in the sauce for the 3 minutes to bring out the flavor, let it stand about 10 minutes before adding other spices. In addition to the salt and pepper, add 1/4 teaspoon ground thyme, and 1/4 teaspoon onion powder or more to your own taste. For a cheese sauce add 2-4 ounces grated cheese while sauce is warm enough to melt the cheese and blend well. If sauce is not warm enough, set over hot water until cheese is melted and blended. Add paprika and a pinch of dry mustard to season. For Cream of Celery add 1/2 cup chopped cooked celery. How to Make a Roux. A roux is made with the same proportions of fat and flour as a white sauce recipe. The difference between a roux and a white sauce is that the liquid is in the pot of food you want to thicken (no milk or seasonings) and that a roux is cooked longer. The rawness of the flour is mellowed and browned, contributing an entirely different flavor to the food. When you make a roux, you start with the oil or butter and flour in a paste. Instead of just bringing it to a bubble, you keep it over medium heat. The constant, continual stirring keeps it from scorching. A minimum of five minutes of cooking at the bubbling stage is needed to remove the raw taste of the flour. Depending on the recipe you might want to stop there, with the flour mixture being a light tan color. A deeper roux will be like peanut butter. For a dark roux, you want it to look like dark brown gravy. This is often called for in Cajun dishes. When adding a roux to the contents of a pot (like beef stew), the food in the pot should not be at more than a low simmer. The roux should cool for about 5 minutes before adding it. As you add the roux, keep the pot stirred so it blends without clumping. Once all the roux is blended into the food in the pot, turn the pot up to a boil and let it thicken at a boil for at least 3 minutes. Then turn off the heat. It will continue to thicken more as it cools. If the food in the pot is delicate and you don't want to stir it rapidly, then drain some of the liquid from the pot and add it slowly to the roux and incorporate it that way. Then add it all back to the pot. If you are concerned about watching fat intake, and want to avoid the use of more oil, there is an alternative. You can take the flour and put it on aluminum foil in a toaster oven or under a broiler. Brown it to the desired color. Take some of the liquid from the pot and blend it with the flour once it has cooled. Then add to the pot and bring to a boil as described above.